Here's an odd one: today the FIM announced revised results from the Monster Energy FIM Motocross of Nations, which took place on October 6 and 7, 2018. At the event, fuel samples were taken and tested from eight motorcycles that competed, and seven of them passed the fuel test, but the fuel in the bike of Italy's Michele Cervellin failed. As a result, all of Team Italy has been disqualified from the race, retroactively. The official results from the race now show Italy listed in 30th place, which is last. Italy had originally finished the event in second place, just two points behind the victorious French team. 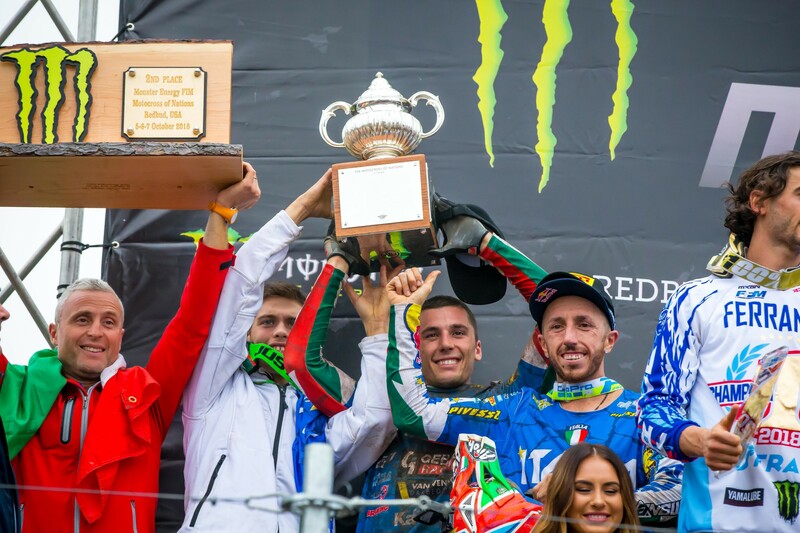 "On this basis, the FIM Race Direction of the above-mentioned 2018 Monster Energy FIM Motocross of Nations has decided to impose upon Mr CERVELLIN's team (team Italy) a disqualification from the entire event, in accordance with Art. 63.05.13 of the 2018-1 Technical Rules Motocross," reads the MXGP press release. This change moves the Netherlands into second in the event, and Great Britain third. Team Australia and Team USA now round out the top five. Here's a link to the revised official results.